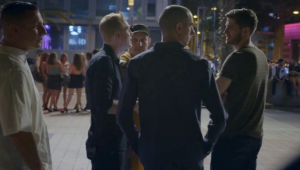 A documentary that will surely infuriate, The Pickup Game is a film that exposes the pickup artist industry. The film digs into the origin, the mythology and what the industry is like today. I’m surprised that the film actually included a lot of testimonials and footage provided by the pickup artist themselves. My roommate watched the screener with me and recognized the pickup tactics a few days later when someone approached her and tried them on her, so it’s also informative in a weird way. Normally this type of film would only explore the one obvious angle, but the directors also took it in several unexpected directions that helped to add additional dimensions to the world of pick up artists. Definitely recommended.